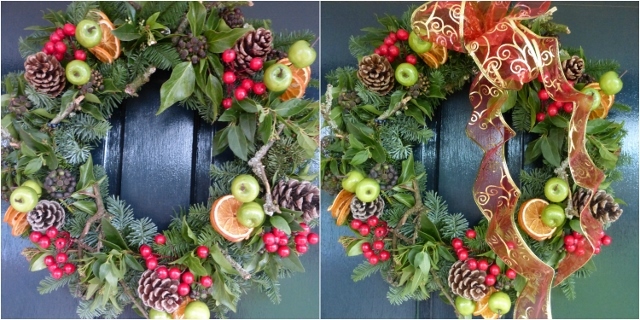 As my door wreath classes come to an end my ladies head home to display their creations with advice about how to care for their door rings over the festive period. Your door wreath will last longer if its hung in a sheltered spot, away from the extremes of the weather – not easy when you can’t move the position of your front door or have any control over the winter weather! Personally, I’ve never had any difficult keeping my door wreath looking good from the making of samples in late November until twelfth night (and sometimes beyond). A word of warning though, if you’ve incorporated faux berries into your design do make sure they are weatherproof – I had an unfortunate incident a few years ago where the berries I was using at my workshops held up well on my front door, but not quite so well on the rain-battered door of one of my workshop attendees. If in doubt, stick to natural materials such as pine cones and cinnamon sticks. When making your own door wreath you’ll need to condition your foliage well, as it will be out of water for the duration and will, over time, dry out. If your wreath is made on a moss vase, some moisture will be retained. A spritz of water from time to time will help with hydration. Don’t be tempted to soak your wreath in water though – the moss will become waterlogged and the wreath really heavy, so you may find it drips water down your door and is too weighty to hang. 3. To bow or not to bow? I’ve notice this year that ribbons and bows seem to have fallen out of favour. If you still love a burst of colour your bow doesn’t need to be fixed at the top of your wreath – unless it’s being used as part of your hanging mechanics – why not try a different position this year: five o’clock, six o’clock or eight o’clock ribbons all look great. Spray paint can be your friend if your door wreath looks like its irreparably damaged/dried out. If there are patches of dying material, in the first instance I’d suggest you cut them out – and add (glue gun) in replacement stems. Alternatively, be brave and give a light touch of paint to areas of your wreath – or go mad and apply layers of solid colour. Either looks good. 5. Door hook too high? If your door wreath hangs too high on your door, you can easily alter its hanging height by using a length of ribbon – check out my video clip for a simple how to. Click here http://eepurl.com/N1K81 to sign up to my newsletter and I’ll keep you informed of my forthcoming workshops and classes. Signing up is a two-step process, so don’t forget to complete the subscription process by clicking on the confirmation email you’ll receive.